Located along Batasan Road, in Brgy. Batasan Hills, Quezon City is the Batasang Pambansa, where the Philippines’ House of Representatives hold their sessions. 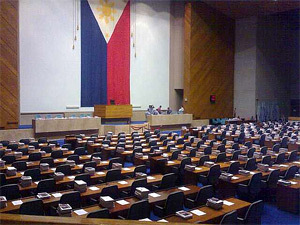 Batasang Pambansa is Tagalog for “national legislature,” although its official English translation is the “National Assembly.” The Batasang Pambansa is also the building where the joint sessions of the whole Congress takes place, such as when the President gives his or her State of the Nation Address or SONA when the Congress opens its session for the year. Because militant groups have made this annual event a rallying point, security preparations in the vicinity of this building has also been an annual task. Anyway, the building was conceived as a place to house the Philippine Congress back in the 1950s shortly after Quezon City became the country’s capital in 1948. During that time, the Congress held its sessions at the Legislative Building in Rizal Park, which now houses the National Museum. Lack of funds (this was post WWII, after all) delayed the completion of the building complex to the 1970s during the Marcos Administration. Marcos then established the unicameral Batasang Pambansa parliament and the building became its home. After Marcos was overthrown in 1987, the bicameral Congress was reestablished and the lower House made the Batasan its headquarters, but still retained the previous parliament’s name for the building. For another speculated record, I believe that the Philippine flag hanging behind the podium of the Batasan is the largest Philippine flag in current use. I’d definitely welcome any information about any larger in-use Philippine flag.